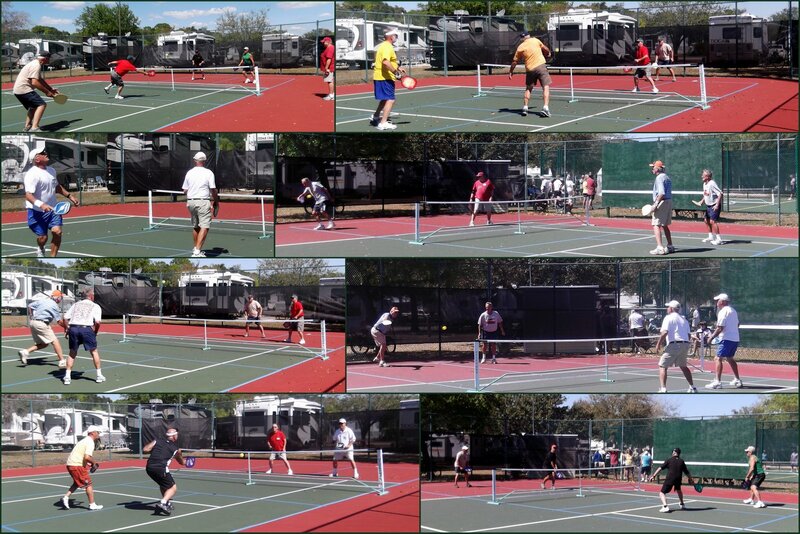 As part of the 2012 Equity Life Style (ELS) Sarasota Expo, pickleball was played at the Harbor Lakes RV Resort in Port Charlotte, Fl. on Tuesday March 6th. Park Manager, Kim Harper, with the help of resident Marty Keinhofer and local USAPA ambassadors Rich and Donna Donald took the lead role in organizing Harbor Lakes' first ever event as part of the Sarasota Expo. The park only has ONE pickleball court, so the tennis court was converted to two pickleball courts for the day in order to accommodate the 40 players who registered to play. In addition to the competitors from Harbor Lakes, players travelled from the Terra Ceia community in Palmetto, Fl, Bay Indies RV Resort in Venice, Fl and the Thousand Trails RV Preserve in Wauchula, Fl. It was park vs park.......and after a brief welcome the games were underway. Below, the men take to the two converted courts for their round robin competition. There were ten teams and each team played four games with conventional scoring to 11 points, win by two. The four top teams played off to determine the 1st, 2nd and 3rd place finishers. The ladies played a very fun "random draw" round robin. Each player competed in four games of 15 point "rally scoring". Mother Nature provided some pretty stiff winds today - so everyone had to be on their toes. Water, Sports Drinks and soda were provided for the players and a tented room was set up throughout the day for players to get out of the sun and enjoy their lunch. Sandwiches, fruit, fresh veggies, energy bars, and some really great desserts were on the menu and provided to all the players. Hats and visors from Pickleball Paddles Plus were awarded to all of the winners along with Target Gift Certificates. Key Chains, Stress Pickles and Pickle Pens were given to players as door prizes . 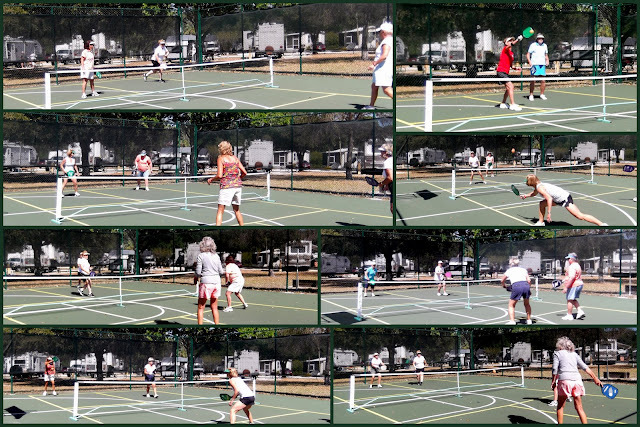 Park Manager Kim Harper has never played pickleball, but today got to witness the competition﻿ and fun that pickleball players experience every day. Players told her that next year the competition would include all the park managers!!! The organizers and all the helpers from Harbor Lakes could not have done a better job providing the players with some great competition , some great food and some awesome prizes. Hope we can make this an annual event!! We had a ball. Great write-up Donna. You really made this happen! !